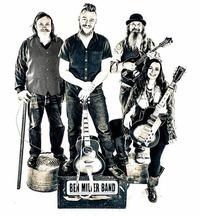 Ben Miller Band has not stopped touring since the August 2014 release of their acclaimed sophomore album, Any Way, Shape Or Form. In addition to a slew of festivals they have become ZZ Top’s go-to opening act and have opened for the blues rock giants all across the U.S. and Europe. In April, the foursome will tour Canada with George Thorogood. They will team up with JJ Grey and Mofro for a string of dates in May.